The race to replace U.S Rep. Steve Stockman in CD-36 is a battle of geographical allegiance between supporters of the two Republican candidates headed to the May 27 runoff. 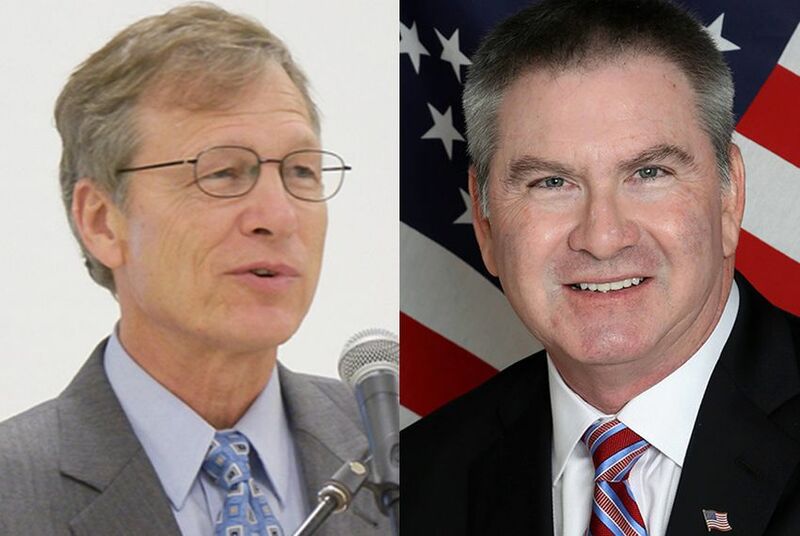 The race to replace U.S Rep. Steve Stockman in Congressional District 36 is a battle of geographical allegiance between supporters of the two Republican candidates headed to the May 27 runoff: Brian Babin (l) of southeast Texas and Ben Streusand (r) of suburban Houston. The race to replace U.S Rep. Steve Stockman in Congressional District 36 is a battle of geographical allegiance between supporters of the two Republican candidates headed to the May 27 runoff: Brian Babin of southeast Texas and Ben Streusand of suburban Houston. Stockman, R-Friendswood, gave up a prospective third term in the U.S. House to launch a failed bid for Senate against Republican incumbent John Cornyn. Twelve Republican candidates vied to replace Stockman in the March primary. The top two vote-getters were Babin, a dentist and former mayor of Woodville, and Streusand, a former mortgage banker favored by some Tea Party groups. Babin led with 33 percent of the vote followed by Streusand, who received 23 percent. Stockman spokesman Donny Ferguson said the incumbent congressman has not endorsed either candidate, one of whom will face off against Democrat Michael Cole in the November general election. CD-36 stretches from southeast Houston to the rural East Texas counties of Newton, Jasper, Tyler, Polk, Orange and Hardin. Babin and his supporters arguably have more to lose in the race. Metropolitan Houston and its surrounding suburbs are represented in 10 other congressional districts, but rural southeast Texas has only one slot in the U.S. House: the 36th district. Babin said those rural counties have different needs from people in Houston, and that his opponent would be out of touch with those concerns. “This is a call of duty for me, to run for Congress,” Babin said. The conservative candidates hold the same positions on most key issues. Both Babin and Streusand have said their highest priority in Washington would be repealing the Affordable Care Act. They say they won’t stand for the invasion of the federal government into the everyday lives of Americans. Babin highlighted his support for a more secure border, welfare reform and reducing government bureaucracy. Streusand said his main concerns include protecting gun rights, achieving energy independence and building the Keystone XL pipeline. Issues aside, the two conservatives have notably different styles. While Babin is soft spoken, Streusand offers fiery rhetoric. Streusand said he isn’t afraid to challenge the “Republican establishment,” though his supporters include some of his party’s standard-bearers, including state Rep. and former Texas House Speaker Tom Craddick, Comptroller Susan Combs and Paul Bettencourt, the former treasurer of the state Republican Party. Streusand also has the monetary advantage: He raised almost double what Babin did, though 92 percent of it was self-financed. As of March 31, Streusand had spent $658,775 on his campaign, compared with Babin’s $202,887. Babin suggests that money isn’t a substitute for elected experience. He has served in Woodville for 35 years, as the mayor, a city councilman and a school board member. Streusand has no elected experience, though he was the chairman of the conservative advocacy group Americans for Prosperity and served on the Interstate Oil and Gas Compact Commission under Gov. Rick Perry. Streusand said his lack of experience holding public office isn’t an issue, pointing to Ted Cruz’s success in the U.S. Senate despite having no previous elected experience. Streusand has worked to make an issue of Babin’s political career in Woodville. He has alleged that Babin voted multiple times to raise property taxes, including a 187 percent hike in 1993. The accusations prompted two local government entities to refute them. The Tyler County Appraisal District sent out letters to taxpayers in the area saying Streusand’s allegation was misleading and false. The city of Woodville also sent out a disclosure noting that while the tax rate fluctuated during Babin’s tenure, it cumulatively decreased by 70 percent. Disclosure: Rice University is a corporate sponsor of The Texas Tribune. A complete list of Texas Tribune donors and sponsors can be viewed here. *Editor's Note: An earlier version of this story incorrectly referred to Ben Streusand as a former mortgage broker. He was a mortgage banker.